I entered my flat through the front door and went upstairs, pausing to straighten the photo over the settee in the hall. I crossed to the main sitting room, gazed out of the window, and was amazed to see an unknown woman standing in the smaller sitting room staring straight ahead. "Hi! ", I called, suppressing questions like: "What the hell are you doing here? Who are you?". But all was well. We were both in Second Life and Nellie had just come to check out the place before a meeting began there two hours later. Anyone who is interested is welcome to join. The easiest way is probably to write to Nergiz. Last week we decided to meet at my place, and there were a number of potential topics for discussion. In the event we concentrated mainly on a demonstration by Nergiz on how to build an object that could pass out information when touched. The simple pyramid I built under Negriz's tutelage. When clicked on, the pyramid provides you with a copy of a pre-written text. This is often used to let members of the group know where we are when we move from an initial starting place and they arrive later. It could also be used, though, for automatising the passing out of texts or SLURLs (a SL URL) in a teaching context. What struck me last night, though, sitting on chairs on my verandah, with the trees blowing in the breeze and the light turned to "midday", with a view of Serov's 'Girl with Peaches' visible through the windows was what an ideal learning situation we were in - this really was tasked-based learning and we needed language to ask for help, for confirmation, to request another demonstration or to get help when something had gone wrong. The fairly simple process we were attempting, did not have to be described with words alone, it could be demonstrated and a third party could look at one's own attempt and make suggestions if things were going wrong. 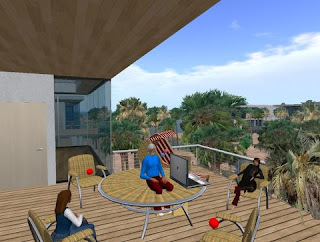 Of course lanugage learning is not about making objects, though building an object can be exploited for language learning purposes, but I remain convinced that a resourceful, creative language teacher who has mastered the way Second Life works could easily come up with exciting way of language learning. 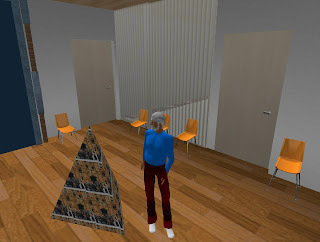 A few have already done so, Kip Yellowjacket and the folk at LanguageLab, to mention a few. And although two people last night could not get their microphones working, three of us at least were using our own voices to communicate. (I'm very pro-voice in SL. It seems a pity to lapse into typing when voice is possible). A newcomer exclaimed excitedly how real it all felt and what a warm, friendly atmosphere could be created. Thanks for all the praise, which I share with the group members (almost 70 by now on the wiki), who make this possible. Language teachers who would like to join us can either contact me or request access through the wiki. Alicia and Maru, the co-founders of the group, or I will then add you as a writer to the wiki. Hope to see you next Friday, Dennis. A very creative way of sharing our meetings and great pictures. What you mention is very true, SL allows you to use language easily in a comfortable, natural way. I hope your blog draws more members to the wiki and to the meetings. Your description is certainly appealing. Hear you next Friday dear. Love the blog. I have added the RSS to my special blog list. I apologize for dropping by 2 hours ahead of time. I do that in real life, too. I highly recommend joining the Friday meetings. SL provides incredible learning experiences for those who join. However, how do we encourage those who don't know what they are missing to join??? The LAST thing you need to do is apologise. I just found it interesting that I reacted initially as if it were in real life. With three followers I'll try to make sure if I blog more about our Friday meetings I'll do it in this blog, and not start another!